Wales is a very violent place with a binge drinking culture. I say choose your friends and choose your family very carefully. In Wales you are more likely to be assaulted by someone you know than anywhere else ­­­­in the UK. So says Barbara Wilding, ex-Chief Constable of Wales, quoted by Zoë Brigley in the epigraph of ‘Rugby Club Love’. This is the opening poem of her word-and-image essay with photographer Nathan Roach, ‘Beyond the Barren Lands, Bridgend’s “Suicide Spate”’. There were reportedly twenty-five, mostly teenage, suicides in the Bridgend area between January 2007 and February 2009, mostly by hanging. Claims were made for a copy-cat cult, fuelled by social networks and mass media coverage. Brigley’s poem, ‘Rugby Club Love’, deliberately exaggerates this death cult theory in lines such as ‘We ride our despair / like a troublesome horse; Mari Llwyd, the star-horse, horse of frost, / white horse of the sea, its skull stripped to pearly bone.’ But Roach’s photos tell a different story where death-on-a-rope isn’t the only alternative to living in the pub. Some may be of drunken crowds, but they are dancing joyously to local young bands. These lads, whether the skater boy on our cover or the chirpy members of band Your Local Hero, look to have a happy future and plans for what to do there. For those of us who inhabit the real Wales… there is a danger of losing sight of this mirror-Wales, of dismissing it as twee or irrelevant or even the result of well-meaning outsiders sentimentalizing a whole culture. I think that would be a mistake. We have to understand that we have something – intangible, unmeasurable, fugitive. 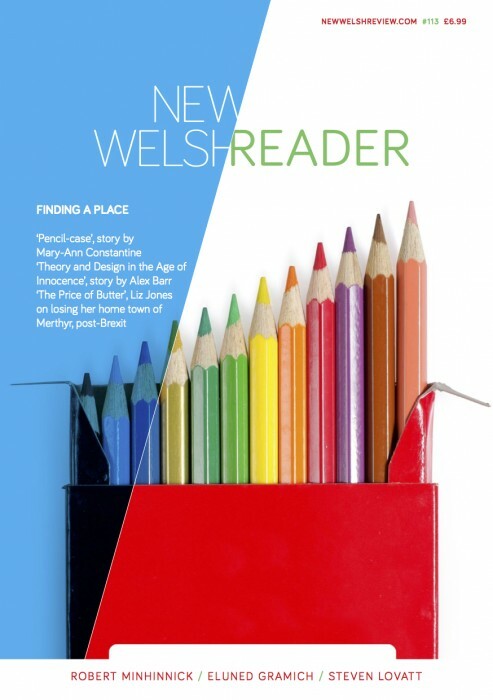 It is this that has contributed enormously to recent literature in certain fields and different media, and also – like it or not – to the way Wales is perceived by a significant demographic. We have a mirror-image. And it reflects us and our culture, however warped and wonderful we may look in it. While I respect Fisher’s views, there are greater dangers in this ‘warped’, outsider reflection than she acknowledges. The ‘significant demographic’ that associates Wales with wizards may grow up to couple Bridgend with suicide and link Cardiff to bared bums (though, for once, we may thank the Mail for counting Cardiff’s sins as British). The problem lies as much in the distorted image as the mirror’s size, how shiny it is, who’s holding it, which way it’s facing, and why we just keep looking in it. These are big questions that New Welsh Review is addressing. Funders and paying readers, we are proud of you: let’s swing some beads! next editorial: Boing The Gong, We're 100!